Are you still searching for perfect keyword research tool to grab most profitable keywords which are most comfortable to rank? Are you confused between keywords, long tail keywords and its technical terms? Here is the perfect solution for all your blogging keyword research projects. Today I am sharing honest KWFinder Review and how it is merely the best most accessible premium tool to get thousands of profitable keywords in seconds. So let’s start. Kwfinder is basically a simple and easy KW research tool that that really simplifies the keyword research process. There are hundreds of keyword tools scattered over the web from free to paid but their process is not so natural and newbies get confused. What is KWFinder? Can it save your SEO efforts? KWfinder is a premium keyword research tool which enables you to find low competition long tail keywords for your blog or website. It is an alternative to Google keyword planner or long tail pro. When I come to blogging & affiliate marketing, we all know the importance of keywords. It’s like the key to success in blogging or internet marketing. Finding profitable keywords is always a time-consuming and challenging task as you can’t still1 guess the right keywords. You will have to take help of google keyword planner or any keyword tool to get exact ideas about your topic and how much traffic you can get on that particular posts. To ease all these burdens of a blogger or SEO professional, KWfinder was launched by mangools. It’s just like another premium keyword research tool but with simple easy to use UI, cost-effective pricing & more powerful options which will make you ♥ KWfinder! We all know low competition long tail keywords are secret to rank on top of google. These keywords are typically long tail which are also called targeted keywords or buyer reader keywords. As these keywords are searched less frequently, It is easier to rank with long tail keywords. Long tail keywords can be generated using premium keyword search tool by entering a keyword term, and you get exact long tail or related keywords with competition analysis, keyword difficulty analysis so you can use them accordingly on your website. KWfinder is built specially to help find hidden profitable secret keywords for any niche or topic. A quick search on KWfinder dashboard can give thousands of low competition keywords so you can build the content of it and rank easily. No installation is needed to run KWfinder as the app works completely online on the cloud. Unlike other keyword tools, You do NOT need to connect your Google AdWords account as they have already integrated premium AdWords at their blackened. Once you create your account on KWfinder, you can instantly start using it. With keyword difficulty feature in KWfinder, You can find keywords that you can easily rank for.. The most beneficial feature of any web-based premium keyword research tool is to analyse keyword difficultly based on various algorithms. This is a most in-demand feature, and here on KWfinder you can get real-time keywords SEO difficulty quickly based on SEO metrics designed for analysis of organic search results. With keyword competition level you can get an idea how easy or hard it is to rank for a particular keyword. Find hidden gems keywords with multiple research options. This is an exclusive feature which I think is yet to be integrated into other players in this industry. With this feature, you can reveal keywords which you competitor are missing using KWfinder productive & user-friendly interface. search volumes for keywords are most important part of SEO. One can know how much the particular keywords are being searched from numerous location. KWFinder provides exact search volumes from KWFinder data & algorithms from, numerous SEO agency. So KWfinder always generates keywords with exact search volumes for k/w that are close variants for each other. KWfinder allows you to add bunch of your own keywords via import keyword feature. This is the pretty helpful feature as if you already have a list of keywords or guessed k/w, you can import it on KWfinder and get details, SEO difficulty, k/w search volume, SEO score and more information in a single click. You can also export your popular ticked profitable keywords to an excel file so you can use those while writing content for your website or blog. Don’t just search on google.com, narrow down your keyword searches for different locations variant of Google and locally. On KWfinder while searching for your long tail keyword, you can select a country, state or city that fits your need. You can also choose from over 40+ languages to get accurate local results. 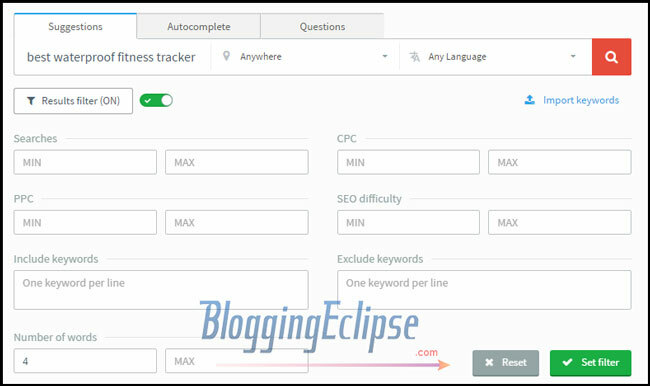 Search filter have options to filter search by search volume, SEO difficulty, keyword difficulty, number of words, CPC, include or exclude particular k/w , location & language. Better support is what we expect from online services and products. KWfinder comes with handy multiple support options for users including a very responsive live chat support. They have in-depth documentation and knowledge base including regularly updated blog posts for tutorials and SEO news & KWfinder updates. KWfinder have dedicated Email support & live chat support for all their users. They not only help you to resolve any KWfinder working issues but also extend their support to find best profitable keywords for your website. As an SEO professional, I have been using several keyword research and SEO competitor analysis tools such as Longtail Pro, SEMRush, Moz and many more. All are good as they have different unique features in each of them. Earlier for keyword research, I was using Long tail pro and its good but when I started exploring KWfinder & its features, Believe me, KWfinder is much better regarding reliability, performance and cost. Kwfinder offers accurate results in seconds with easy to use online cloud-based dashboard & tons of great features. I have been using KWfinder extracted k/w on my some new websites and results are pretty awesome. It’s always easy to rank with low competition long tail keywords as compared with difficult saturated keywords. I will write a different post with detailed tutorials for using Longtail K/w on your post for better On-Page SEO. One of the reasons I love KWfinder is that it is super affordable & comes with the best performance. Whether you are a new blogger or experience affiliate marketer, KWFinder has plans for all types of clients. KWfinder fits in your budget as it comes with cheap pricing as compared with other players in the market. KWfinder comes with annual & monthly subscription plans. I would recommend going with yearly plans as it gives a lot of savings. The premium plan costs $39.90/Month when you pay for 12 months. The basic plan costs $29.90/Month when you pay for 12 months. The plan costs $79.90/Mo when subscibed for anual billing. It includes 1200 keywords lookup per 24 hours. We have already enabled latest KWfinder Promo code for this year, so you just need to click on the he special button below to activate offer. Also adding coupon code “BLOGGINGECLIPSE” at the time of checkout can give you extra 10% off on billing. If you wanna give a try or have a tight budget, then you can signup for monthly plans. You can get 10% discount on all monthly program by using this exclusive coupon code :BloggingEclipse: on the checkout page. I will conclude KWfinder review by recommending it to every blogger & webmaster. If you haven’t tried Kwfinder yet, Go & try its free plan first and you gonna discover its powerful capabilities to give you best long tail keywords in seconds. There are many excellent keyword research tools available on the web, but when it comes to pricing, KWfinder is cheap regarding price from all of them and have many great features which make it highly trending in SEO industry. I love KwFinder and I highly recommend it to all my blogger friends. It has lots of features which I didn’t find in any other tool at this price. Of course, there are many similar functions. But we try to make accent on user experience. It’s really easy to sort, filter and download all results you gather. Waiting for your opinion.